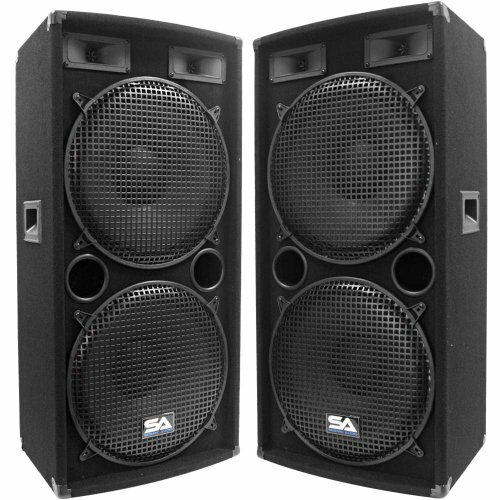 Pair of Dual 15" Audio Speakers Model # - SA-155.2 (Set of 2) Woofers: 2 15" - each woofer has a 50oz magnet with a 2" voice coil 500 Watts RMS & 1000 Watts Peak Wired at 4 ohms 45Hz to 20KHz Sensitivity: 96 db Two 2x5 Tweeters 5/8 plywood front panel Steel grills over each speaker Pocket handles Terminal cup with two 1/4" inputs Can be Daisy Chained Dual ports 38" tall x 16" wide x 12" deep Weight: 51 lbs per cabinet These speakers are brand new. One year warrantyThis listing is for a pair of these Dual 15" speaker cabinets. You will receive two identical speaker cabinets, pictured and described above. Each speaker cabinet has the specs above.Best for vocals, keyboards, churches, weddings, any size DJ gig, any PA systems. These speakers have awesome bass and highs and a great all around sound.